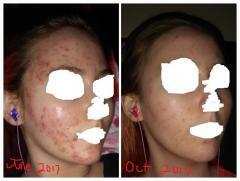 These are photos of my skin in June and then now. It's a huge, huge, huge improvement for me. I don't have perfect skin, and I am very aware that it could get bad again, but god does it feel good to be able to wash my face without it hurting horribly. The before photo isn't of my skin at it's worst, but you get the point. I blurred out parts of my face because privacy or something.